People ask me what there is to do in Shanghai, so I thought I would highlight the amazing diversity of ‘cultural’ activity here in Shanghai. The Chinese LOVE culture, but it doesn’t have to be Chinese culture, so anything that represents the traditions or cultures / beliefs of any nation or religion, is welcome in China, and usually finds it way to Shanghai. Of course, Chinese culture is predominant, but fascinating! I have been to the theatre twice since arriving in Shanghai, and by describing the two ‘shows’, you begin to appreciate the diversity I am referring to. "I asked myself, why? Why would peaceful monks want to split foot-thick blocks with their bare hands?" says Steve Nolan, the producer of the Shaolin Monks' Shaolin: Wheel of Life show. Before Nolan's trip to China, an emissary had arrived in London. "The Abbot of the Shaolin Temple had sent a Chinese entrepreneur who turned up at the Royal Albert Hall trying to book it for a Shaolin demonstration," Nolan says. "They were very keen to get performing, so I was drafted in to help." Nolan felt it would be a shame to have just a demonstration. "It could have been the Hounslow Kung Fu Club for all you knew," he says. He set about turning the monks' katas (movements) into a stage show. He added a narrative structure which, in its latest incarnation, features 25 monks, four actors and three musicians telling the history of kung fu. There is no doubt that this is a full-on martial-arts show, and it draws a large following of such fans. 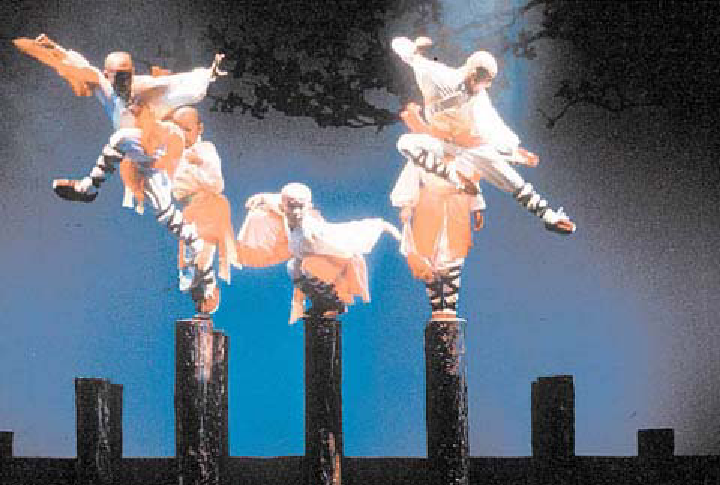 But last year dance critics reviewed the Shaolin Monks because, when they are not jumping or breaking iron bars across their heads or having wooden staves shattered against their chests, their movements are animal-like - graceful and ethereal. The show was truly amazing, the kung-fu was real enough, but it was the mix of colours, actions, dance and choreography that really appealed to me! These are all real monks from the Shaolin kung-fu school in Northern China. The troupe have toured the world, performing in London, New York and across the US and Europe as well as here in their native China. 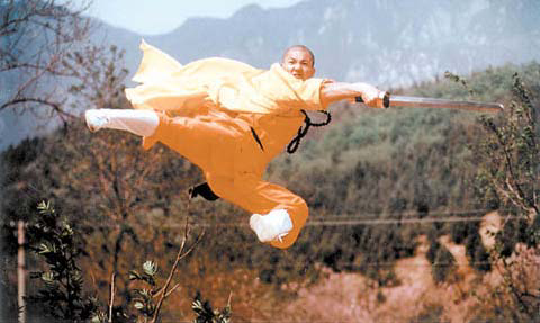 While most of the monks in the show are in their twenties, there are one or two ‘masters’ in their sixties or more, and the "stars" of the shows are the real youngsters, maybe 8 years old, but already well stepped in the Shaolin way of life! If the show comes near you – catch it, you’ll be surprised how much you enjoy it! So, my first night at the theatre in China was a real Chinese experience! My next one was certainly not! The "Riverdance" spectacular began life as a 7 minute slot in the Eurovision Song Contest when it was hosted by Ireland, and served to introduce Irish dance across Europe. The response was unbelievable, and the end result is a full show, performed by two full troupes continuously around the world. "Riverdance" was chosen this year to be the opening act of the Shanghai International Dance Festival. Its impossible to describe this show… the instruments, the choral voices, the lighting and costume colours only go to enhance what has to be the best demonstration of Irish tap to be found anywhere! All I can suggest is go to see the show! Or failing that, if you come and visit me, you can watch the DVD – a poor second best! Anyway – only two trips to the theatre, and already – such diversity! I do have tickets to go to the theatre twice in November too, both times to concerts. Again, demonstrating the diversity of what is available in Shanghai (as well as my own unusual tastes!! ), the first of the concerts is a classical performance by the Vienna Boys Choir … and the second is Mariah Carey! It’s all available in Shanghai!